Isn't watermelon just water? It is actually over 90% water, but that leftover 10% is pretty great. For example, watermelon has more lycopene than tomatoes. Why should you care about lycopene? Lycopene has been considered a potential agent for prevention of some types of cancer. 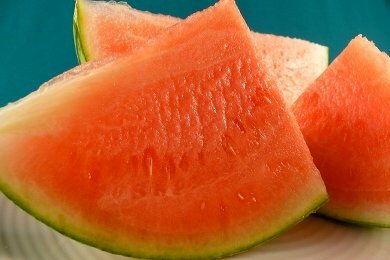 And watermelon consumption increases free arginine and citrulline, which can help maintain cardiovascular function. If you aren't concerned with cancer or heart disease, consider that watermelon seeds were found in the tombs of King Tut. Watermelons and humans have been together a LONG time. Our ancestors probably feasted on it in the summertime. You can think about them as the juice drips down your chin. Watermelon keeps really well. That is why you always see it in fruit salads in airports and Starbucks. You can buy your watermelon, cut it up, and have the pieces stay fresh for a whole week. Don't try that with Strawberries Prevent Cancer!